TORONTO , April 8, 2019 /CNW/ - First Cobalt Corp. (TSX-V: FCC, ASX: FCC, OTCQX: FTSSF) (the "Company") is pleased to announce President & CEO, Trent Mell will be presenting at the Fastmarkets MB Battery Materials 2019 conference in Shanghai, China this week. In conjunction with this conference, Mr. Mell will be meeting with a number of potential investors to discuss restart scenarios for the First Cobalt Refinery in Ontario, Canada . Conference participants include some of the world's largest cobalt miners, battery makers and electric vehicle companies.
" Asia is the most important hub for electric vehicle investment today – China's EV sales are anticipated to grow from just over 500,000 units in 2018 to over 5 million by 20251, while North American companies such as Tesla are in the process of building new factories in Shanghai . As we have now demonstrated the First Cobalt Refinery can produce battery grade material, I look forward to advancing discussing with potential partners." On April 3, 2019 , the Company announced that it successfully produced a high purity battery grade cobalt sulfate using the First Cobalt Refinery flowsheet. 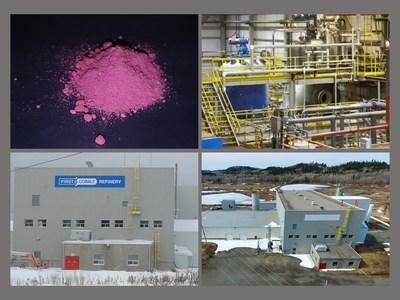 The First Cobalt Refinery is a hydrometallurgical cobalt refinery in Ontario, Canada , approximately 600 kilometres from the U.S. border, accessible by road or rail.